I LOVE candy corn. Couldn't tell you why. Its disgusting. Tastes like sugary wax. Says its made with "all natural honey" whatever. I like it and I eat a bag or so once a year. I am glad its not out any other time of year. I don't consider the other "holiday themed" candy corn to be the same confection. 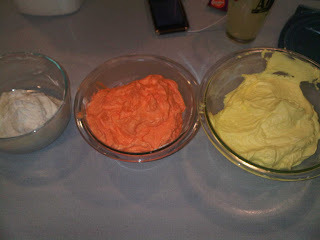 The real stuff is by Brachs and is yellow orange and white. Using my Wilton 1M tip I did a large swirl of yellow then the orange and a small dollop of white to match the candy corns. 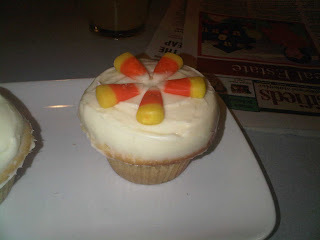 I of course added a candy corn to the top.